This is a puzzle that was given to me at Christmas because it is known that “I like that sort of thing” and the owner couldn’t solve it! I am not surprised. I am coming to the conclusion that it is not soluble. Not that it has no solution, because I suspect that it does, just that there is no rational way to come up with a solution and doing it randomly would take many lifetimes. 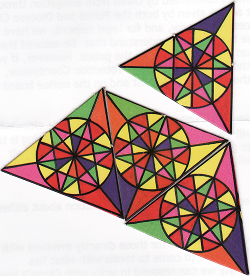 The puzzle contains 100 equilateral triangles each brightly coloured using six basic colours (red, orange, yellow, green, purple and pink). The combination of colours and their pattern around the circumference of each triangle differs from piece to piece. All six colours appear on each piece and except for 18 duplicates, they are each unique. The object of the puzzle is to use all the 100 pieces and build a large equilateral triangle with a base of 45cms (10 pieces). Other than the colours there are no deliberate distinguishing marks on the pieces so there is no way to tell edges from insides. The interior circles on each piece are identical. So mathematics tells us that there are 100! (100 factorial) different arrangements of pieces – that is about 10 ^ 158 or 1 with 158 zeros following. Clearly some pattern matching reduces this considerably as bad matches are eliminated but using the best algorithm I could come up with and the fastest computer available I could not reduce the time required to solve it to within my lifetime or even this millennium. The only other feature I could extract from the pieces was that there were 20 edges (pairs of colours) that didn’t have a corresponding edge to match up with so must occur on the outside; but which of the occurrences of those edges they actually are is anybody’s guess. So…do you know this puzzle and do you have a solution or even insight to a better method? If so I would like to hear from you. The publishers, “Brand Makers International Ltd” of Kirby Muxloe seem to be out of business. [Update] I realise that my description wasn’t good enough as a couple of people have written to say that they didn’t undertstand what the problem was. So I have scanned a few of the pieces so you can see how they have to fit together—colour matching to colour. Do that 100 times and you are done. This entry was posted on 17 Jan 2010 at 15:07	by Rick	and is filed under Miscellaneous. You can follow any responses to this entry through the RSS 2.0 feed. Both comments and pings are currently closed. 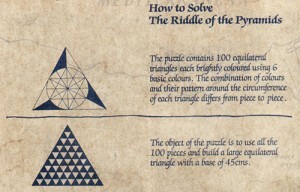 I’m puzzled – as the problem is stated, you just lay the pieces out in a large triangle. There must be some additional criteria if the problem is to be anything other than trivial. Thanks for your comment John. I have updated the description to try and make it a bit clearer. If you like this sort of thing, try The Big Book of Riddles, Puzzles and Enigmas by Fabrice Mazza & Sylvian Lhullier. Bought it for my brother in law today and it has completely shut him up for the last 3 hours ! Has the answers too ‘but that’s not the point’ (or so he tells me). I have been looking on the ‘net for years to see if anyone else has struggled with this puzzle. I spent well over a year on this bad boy, but I did solve it. I could send you a picture. I could send a description, but it is pretty involved. You might not be that interested. The solution was achieved with a combination of computer processing and physical examination of the pieces. Have you had much feed back from others familiar with the puzzle? Hi Walter, I would love a picture for the record (and to prove to myself it can be done with the pieces I have). I too tried computer processing but didn’t make any headway. I also tried cheating a bit and taking advantage of the inaccurate cutting – that was a bit better but still no complete solution. I didn’t try a combination of both. No feedback from anyone else except what is shown here. Could you email it to the address shown on the home page (click the house at the bottom of this page). I have to scan a physical photograph in order to send it. I’ll try and do that this weekend. But check this tidbit out: There are 55 triangles that point in one direction, 45 in the opposite. The circle in the middle of each, identifies these two groups. Ah yes, I hadn’t spotted that. In fact it is not just the circle but the hexagon in the middle of the circle that differentiates them. Now it makes you wonder if that was deliberate to aid solving or an accidental oversight that they weren’t symmetrical. I’m gonna go with ‘deliberate aid’. What it makes ME wonder, is if there is another, unspotted, deliberate aid. If the author of the puzzle intended a non-computer-aided individual to solve this puzzle, you would think that there would HAVE to be more, buried help. As you pointed out: 100! is a VERY big number. Very, very big. Even with a computer, it is too daunting. If the machine could check 100 trillion configurations of pieces PER SECOND (100,000,000,000,000 [US]), and there were 100 trillion machines working on the problem, (31,536,000 seconds in a year), it would still take 2.9×10^122 years to try them all. Assuming we find the answer before having to try them all, and assuming the universe is 13.5 billion years old, we are still looking at 1.1×10^112 times the age of the universe. Unsolvable by brute force approach. Walter’s Discovery reduces the number of combinations down to 55! x 45!, still a huge number (1.52E129) but 29 fewer zeros on the end. Now there is one other feature I spotted. If you look at the colour pairs on the edges then the ones that join together must be reversed i.e. a Red-Yellow joins to a Yellow-Red. If you count them you find that there aren’t the same numbers of these matching pairs. The spare ones MUST lie on the outside edge of the finished diagram (there are 18 of them). But I can’t find a way to use that to aid a solution. Please can you send me the picture of the solution provided by Walter. Like you I have been trying for years to sort this one out using aome form of logic and its driving my wife and 2 kids (now 24 and 26) wild each christmas when I bring it out again and search for new inspiration.